The oldest remnants of human habitation in the municipality of Gallocanta go back to the Early Bronze Age. Other significant findings are the Celtiberian remains, walls of large stones discovered inside the city precinct, in the same place where the castle stood during medieval times. After that, these lands are hardly mentioned until the conquest by Alfonso I the Battler, around 1120. From then on, Gallocanta was considered a district of Daroca, until 1248 when James I of Aragon granted it privileges which led to the setting up of the Community of the Daroca Villages. 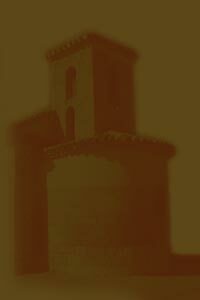 The first time Gallocanta is mentioned in a document is in 1205, when the bishop of Saragossa, Raimundo de Castrocol, assigned to Daroca the rents and tithes of many of the villages that depended on the town. Because it was located right on the border, the region of the lagoon played a prominent role throughout the Middle Ages in the wars between Aragon and Castile. Gallocanta castle was built on a hill inside the town and was visible from practically the entire lagoon basin. Today there is practically nothing left of it because it was dismantled and the stone was used for other buildings. Some of its cornerstones can be seen in nearby buildings and in the walls of the church. The original village had a mill which was documented before 1333 and gradually grew around the castle. The urban quarter spread out to such an extent that it occupied the area between the current parish church and the castle. The church was first built in the XVIII century beside a small cemetery. The area around the plaza gradually became the town centre where most of the public services were located, the blacksmith’s, the council building and the schools.